The revolutionary Zenatek Tracking System (ZTS) solution can keep a real-time protective watch over time and temperature, humidity for – sensitive drugs, from loading to final destination. ZTS is a comprehensive solution to risks of temperature and humidity excursions, damage or tampering during pharmaceutical shipments that can have potentially catastrophic consequences for quality and compliance. Even slight temperature changes during transportation can cause pharmaceutical products to become ineffective or even harmful to patients. Any deviation must be identified and addressed as quickly as possible, which required real-time monitoring. At the same time, latest EU and US regulation places increased emphasis on protection of products from tampering, which increases need for security monitoring of consignments across borders. The primary purpose of the sophisticated ZTS system is to monitor temperature and humidity sensitively and constantly along with physical cargo stability and to deliver instant alerts or alarms if any pre-set criteria are breached during the journey. This means the consignment owner can be alerted instantly to any environmental or temperature excursions, possible tampering attempts and abnormal shocks or tilting of container and pallets. Because the system incorporates advanced communications and GPS technology, it delivers the useful added bonus of being able to monitor geographical position and progress of the consignment in real time over all stages of the journey, from loading to arrival. ZTS was designed to provide cargo tracking and monitoring at an affordable price, while providing what is needed by the user: effective tracking and monitoring of location, temperature balances and unscheduled events. 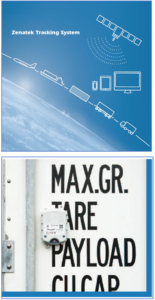 It monitors containers and assets while in transit, providing real-time information to any internet-connected computer or mobile device via GPRS internet provided through close partnership with a major international provider. It is a comprehensive, self-contained service that includes a device that can be positioned without tools internally within a container, attached to pallet or to individual carton. Through a multiple mapping solution via a web-based tracking portal, the position of the tracking device can be located to within meters. 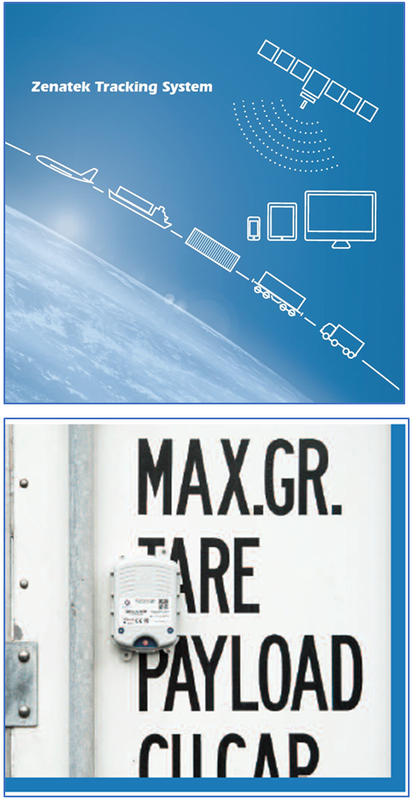 Each unique user has access to the ZTS portal, enabling them to view the real-time location and where the shipment has been, in less than a few minutes, the container tracking device is attached to the container doors by three powerful magnets or easily attached to a pallet and/or box thanks to an adhesive pad. The tracking device sends data frequently, which means it does not need to be retrieved or interrogated at destination, as all the journey information has already been uploaded via the Zenatek server to owner’s system . The device has typical battery life of around one year. Number of daily reports can also be altered according to users’ requirements at each stage of forwarding. Alerts are sent via GPRS to named addressees who can receive notifications by email on PC or mobile devices. The user is able to log in with an encrypted password and ID to view the cargo’s position and determine the type of alert. Real-time logistics data is available as soon as the device has been installed. The client may store documentation within the Zenatek web-based application, such as packing lists, bills of lading and sanitary certificates, which can be retrieved and downloaded with log in by client’s agent at the destination. ZTS ensures shipments are delivered safely and on schedule. It can determine and trace all shipment routes, and send immediate alerts if something unexpected happens For instance, it will alert the user if container doors or pallet seals are subjected to tampering, or flag up any risks to which goods may have been subjected. ZTS also informs clients if a container or pallet is involved in a violent incident. There are available on the market several types of systems equipped with GPS, but nothing of same quality performance and affordable price. The system will trigger alarms when a container’s internal temperature or humidity deviate from predetermined levels set by the client and will inform the user when the temperature or humidity returns to required level. Communication parameters and the temperature and humidity can be remotely configured, even after a shipment has departed. The system informs users when container doors are correctly opened to provide geocoded proof-of-delivery information to the sender, confirming shipment has reached final destination with no unauthorized opening of container en route. The system can provide a full record of the whole transit history, providing enormous quantities of useful data for statistical, efficiency and quality analysis. The system can also confirm return of containers to the shipping company, avoiding unjustified demurrages. Real-time information on the status of shipments and immediate alerts on incidents as they happen provides owners with control of the situation, allowing effective and prompt remedial action, such as reshipping if necessary. Click on Zenatek ZTS real-time tracking service for other information. Click on Zenatek to contact the company directly. Click on ZTS to view video.